When I was younger, I absolutely loved to read, but as I've gotten older I've started to read less for various reasons. Last year I decided that I would try to read more than I did the years before, when I pretty much only read when I had to for school. As I'm an active user of Goodreads, I decided to participate in the Goodreads Reading Challenge. 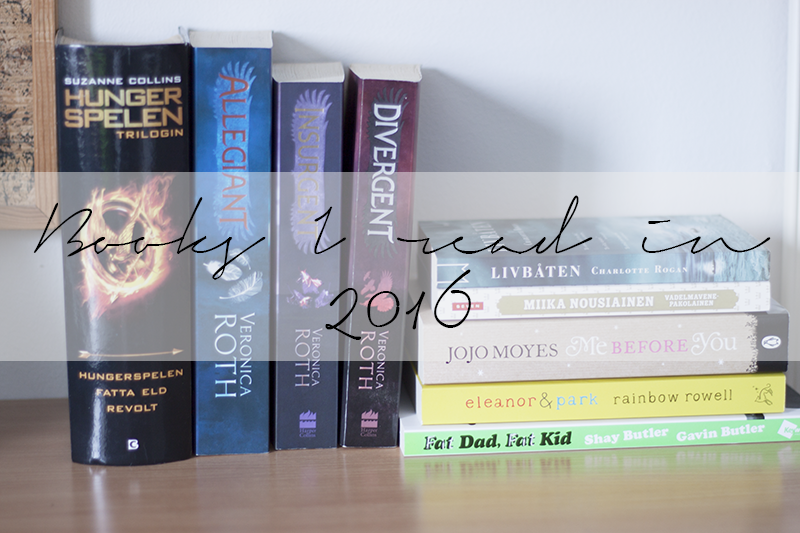 My goal was to read 20 books, I think I was feeling really, really inspired when I did that. 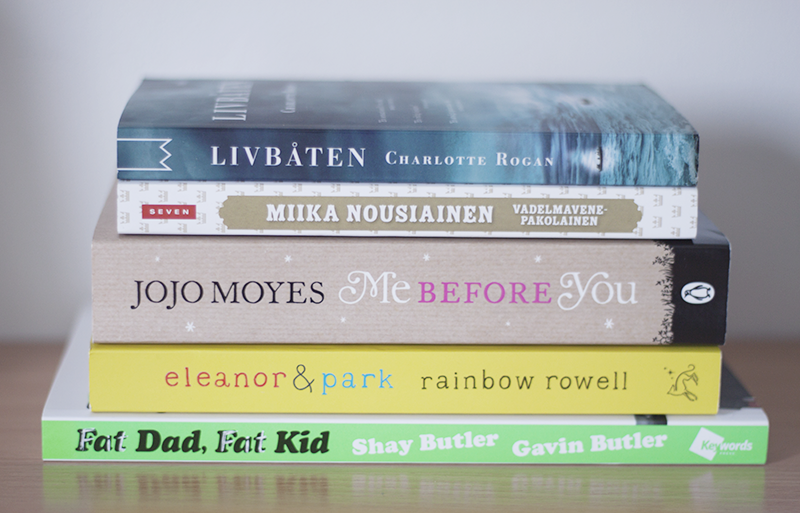 In the beginning of the year I read quite a lot, but after summer I actually didn't finish a single book. At the end of the year I had finished a total of 11 books. It was more than half of my goal, which I'm really happy about. For 2017 I set my goal a little lower, at 15 books. 1. Konsten att göra det man vill med sin tid by Birgitta Sandberg-Hultman (Loosely translated The Art of Using Your Time As You Want). This is a book from 2000 which I found at my grandmother. I only read it because it was short, I wanted to read something and I didn't have any books with me. ★ 2/5. 2. Eleanor & Park by Rainbow Rowell. There aren't enough words to describe my love for this book. I wrote a short post about it after reading it, which you can find here. ★ 5/5. 3. Fat Dad, Fat Kid by Shay and Gavin Butler. I really wanted to read this as I've been watching the Shaytards on YouTube for years, and I find Shay to be one of those people who no matter what he's talking about, it still sounds really intelligent and interesting. Didn't like the book as much as I had hoped, though. ★ 3/5. 4. Divergent by Veronica Roth. ★ 4/5. 5. Insurgent by Veronica Roth. ★ 4/5. 6. Allegiant by Veronica Roth. 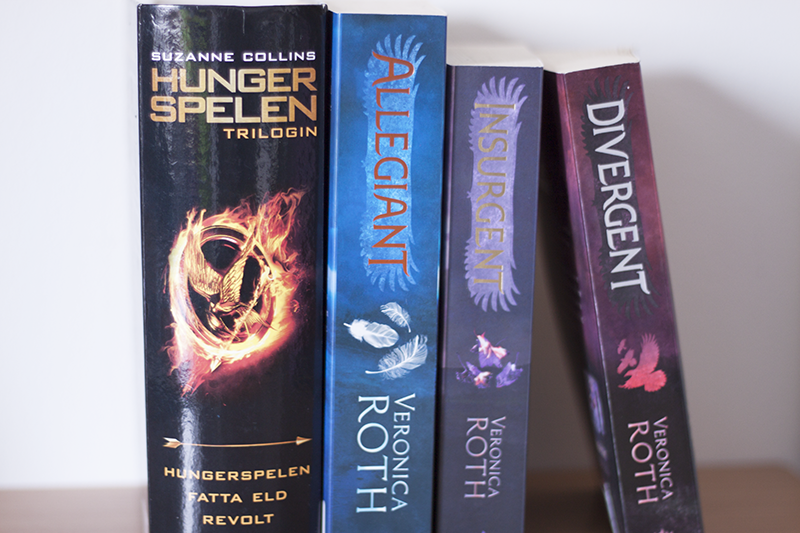 As the film adaptation of Allegiant was coming up, I decided to finally read the book series. I liked it, some parts more than others. ★ 4/5. 7. Vadelmavenepakolainen by Miika Nousiainen (Raspberry Boat Refugee). This one I read for school. It's not the best book, but it's not the worst either. Some parts were really boring and I even skipped some pages here and there because there was absolutely nothing worth reading on them, but then there were some things I really liked too. ★ 2/5. 8. Mockingjay by Suzanne Collins. I started reading this in late 2013 I believe, but it was so incredibly boring I had to take a break from it and I couldn't pick it up again until now. ★ 2/5. 9. Nya dikter by Bo Carpelan (Loosely translated New Poems). A poetry book! I had to analyse a poem for school, so I decided to read the whole book. Poetry is not my thing, I don't understand it, so I decided not to rate this book at all. 10. The Lifeboat by Charlotte Rogan (I read it in Swedish, Livbåten). This is another one for school. I didn't like it at all, I just thought it was really boring. ★ 2/5. 11. Me Before You by Jojo Moyes. This book is just. Beautiful. I cried and I laughed. Sure, there are some things you might find problematic, but I didn't get that feeling from it. Although I didn't personally find it a problem, I'm aware of it and I decided to let it affect my rating. ★ 4/5. It feels like 2016 was a tough year for a lot of people, but also for the whole world as a whole with so many bad things happening through the year. For me personally it was overall quite uneventful. 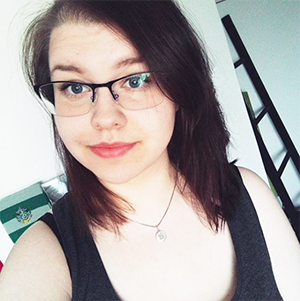 I studied a lot, had my first matriculation exams and worked the whole summer. I did fit some more fun things here and there, which you can see in the pictures. It's already the second day of 2017, hopefully it has started well for everyone. I'm relaxing and spending time at my grandmother's house until school starts again next week. For me these first few months of this year are going to be really stressful. I only have six weeks left of school (!!! ), matriculation exams starting next month, I'm applying for schools in March, turning 20 in April and hopefully graduating in May. At the start of the year many people decide on a New Year's resolution. Do I have any? Kind of. They're more like goals. I have a few small goals, which I've written down in my journal, and will keep them private this time. But overall I'm striving for a healthier me, both physically and mentally. One of my goals are to start blogging again. I have a lot of ideas and motivation, so stay tuned for an active blog again. What were some of your 2016 highlights, and do you have any resolutions or goals for 2017?